Until now, I've been feeling pretty great - no thyroid medication since May 27th (almost 2 whole weeks) and off of work since Monday (June 6th), anticipating a serious crash and burn and -- well, nothing. I ran three miles a day last week, have been out and about, was working 40+ hours until last week - maybe a little bit crankier than usual, but nothing to get excited about. Until today. Got up early, went to a few garage sales - low stress, right? - dropped books off at the library, went to Costco and the grocery store. Things were really alright until Costco, halfway through I started to drag my feet; struggling through the crowds, lifting things in and out of the cart, etc. was much much more tiring than usual. By the time I got to the grocery store, I was so cranky and frustrated and straight up exhausted, I had to come home and take a nap. After shopping. I know. RAI treatment is Monday, so only 5 more days of funky diet, no pills and glasses-but-not-contacts. Sigh. Leftovers from last night's amazing vegan/gluten free Roasted Vegetable Tart - even better than last night! 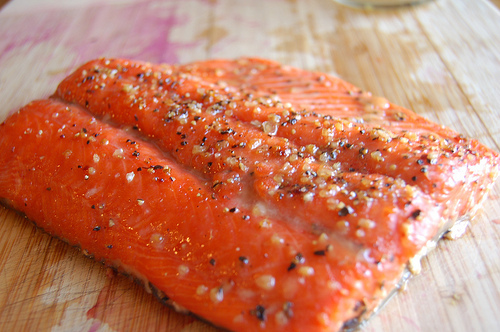 Baked Salmon with Herb Butter using Copper River Salmon - YUM! Sooo sorry, Kelsey. Hopefully, tomorrow will be better....learn to take it easy on yourself and get lots of rest. I understand your fustration, but until you get thru this crummy stuff, learn to live a "low key" life. You'll be "right as rain" before you know it! !